Unsurprisingly, it doesn't drive as well as it did in its heyday - particularly after being stored away in a barn for 40 years. While we were fully expecting to see the after images leaked online, it was a genuine surprise to see the original 1968 Ford Mustang 390 GT Fastback driven by Steve McQueen himself in Bullitt appear alongside it to commemorate the film’s 50th anniversary. Remarkably, it was only . Its current owner is Sean Kiernan, whose father, Bob Kiernan, bought the car back in 1974 for around $6,000. After his father passed away, Kiernan got the car back to running order in 2014, but it wasn’t restored so it still has all of its original parts. As such, it’s running on the same 50-year old engine, tires and shocks. It’s even still finished in its original Highland Green paint. It drives much worse than a 50-year-old car because nothing's been done to it. It's literally been sitting in a barn for the last 40 years at least," Leno said. It’s safe to say, then, that it doesn’t drive as well as it did in its heyday. But if you’re a car movie fan, nothing can beat the thrill of knowing you’re sat in the seat of the actual car that Steve McQueen drove in . Leno also got a chance to drive the new 2019 Bullitt Mustang tribute car, and concluded that the new car still gives you the same feeling you get from the movie. "When you get in this Bullitt Mustang, you become Steve McQueen," he said. 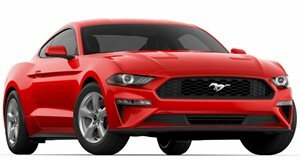 The new version is a faithful tribute to the iconic movie car, featuring a more powerful version of the Mustang's 5.0-liter Coyote V8 that produces 475-horsepower and 420 lb-ft of torque, resulting in a top speed of 163 mph. It's also finished in Dark Highland Green as a homage to the original Bullitt Mustang, and will only be sold with a six-speed manual when it arrives in dealers this summer.